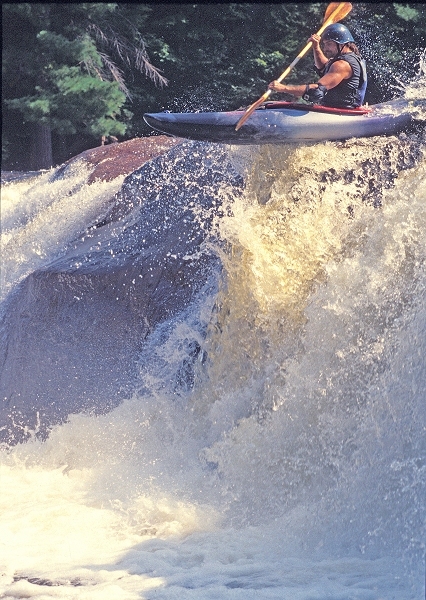 Dennis Squires (RIP Bro), one of my paddling heroes and close friends. Prolog: John’s Brook was first run solo by Dennis Squires (RIP bro) in the 90’s. Dennis had been telling me and Mike to hit it for a while and with the spring runoff we finally got a chance to hit this gem. This article was published in AW Magazine. John’s Brook is the newest in a long line of productions aimed at appealing to the segment of the kayaking community that have hit their heads on a few to many rocks. The first two hours is spent watching kayakers hike up 3 miles of steep rocky trails dragging 100 lbs of gear through the mud, over creeks and over huge boulders. You can tell from the gradient that once these guys hit the water, there will be hell to pay. While most runs gently ramp up for the viewer, once they get to the water Johns creek starts out full-bore and never slows down. The entire 5 miles is just one long climax with little or no interruption. Most people who enjoy this spectacle will be forced to switch over to auto-pilot or will end up running out of energy and adrenaline after the first 15 minutes. After the first couple of hours, you wonder when it will end, and whether or not the actors will just say “enough” and walk out of the canyon. 1:1 Yea verily though shalt not let go of thine paddle, even if thou arent’ stuck in a strainer, struggling to get out of thine boat 1:2 For if thou dost let go of thine paddle, then thou must pull thine partner over that same log that thou hast broached on 1:3 And as thine partner looks at thee with sad and worried eyes begging you to be careful, you shall push him into the water on the downstream side of the log and say unto thee ‘Thou must go now alone and fetch my paddle which hath gotten away from me’ 1:4 And with great fear thine partner shall boat quickly, yet carefully down the next ¼ mile of rapids until he doth portage to avoid yet another log whith hath blocked his passage. 1:5 Givith not up though, as another paddle awaits ye back at thine trusty car. 1:6 Thine friend shall journey to the car and return with his spare paddle so that you may complete thine run 1:7 Athough the rain continues to fall, and the creek continues to rise and although you are hungry and tired, you must continue on. 1:8 For you have traveled so far to see it, and you will have it done. While only a dozen or so drops rivaled the Bottom Moose for difficulty, the sheer continuousness of the river caught Mike and myself off-guard. It was a bad gear day, though it was a good paddling day. Usually I’m anxious to keep paddling after most runs. This time I was happy to be back at the car. It had 10 hours since I had eaten and I had drunk all my water bottle after hiking the first 1/2 mile and had been drinking river water the rest of the way. By the time we had reached the takeout I was relieved and exhausted. The next time you see an old school creeker who has been paddling longer than you’ve been alive, ask the where the best run in the North East is. If they say John’s Creek, you’ll know to shudder in terror at the thought of the heinous hike and of all those drops, one right after another with few eddies and lots of wood. More strainers in fact than I have seen in ALL the rivers I have run in my piddly little 4 year paddling career. While everything else in NY is in flood, this creek is one that is better reserved for the certifiably insane.